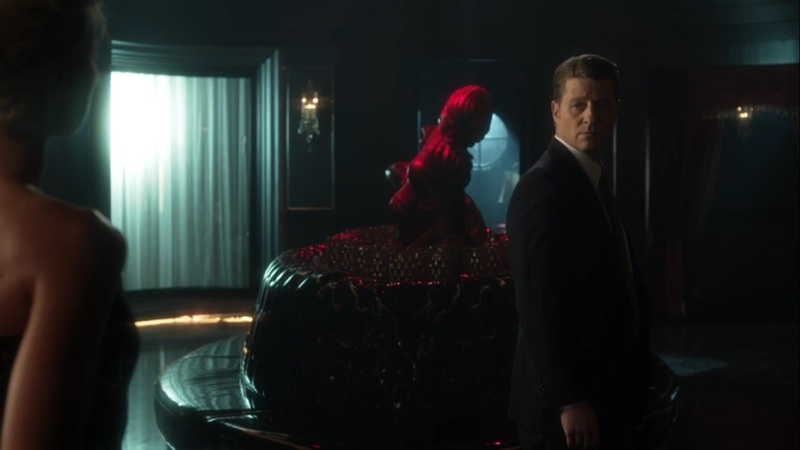 A Look at Gotham- Season 5, Episode 4: “Legend of the Dark Knight: Ruin” | What Else is on Now? The episode begins with Haven in flames as survivors make their way through the wreckage. 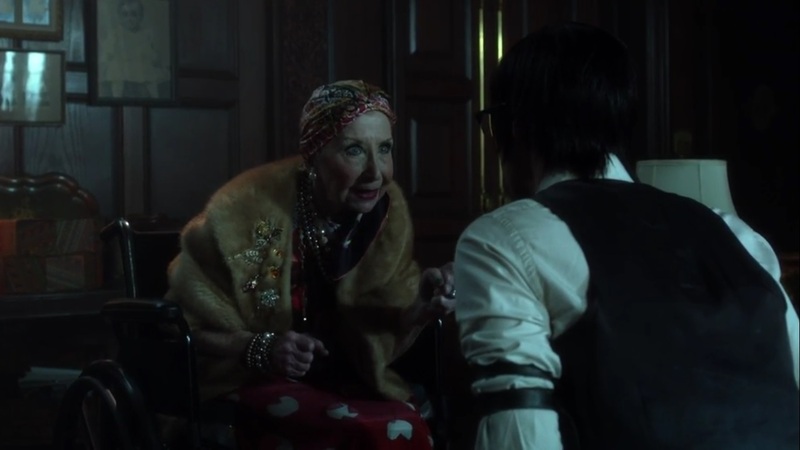 Barbara is still fixated on getting revenge on Penguin, but there are far more pressing matters right now, so she can’t bring herself to shoot him. Jim and the GCPD help with the wounded. He immediately blames this on Penguin, but Oswald wouldn’t allow this sort of thing. Plus, as far as he knows, none of the gang members had explosives. After telling Harvey to get more hoses on the fire, Jim goes back to helping the wounded. By morning, the fire is extinguished, but Haven is lost. Harvey brings Jim his burned badge. So is Will gone? No one can say just yet. Later, Jim reports that the death toll stands at 311, 49 injured, and others unaccounted for as of now. As for who is responsible, Jim believes it could be any of the gangs, but it’s impossible to rule anyone out. Jim’s radio friend has promised help, but they haven’t delivered yet. Jim ends the transmission and goes down to the main precinct floor, as many citizens now fear for their lives. He knows that the people have lost someone they care for. He shares their anger and grief, but whoever destroyed the building can’t destroy their hope. He promises that he won’t stop until he finds those responsible. But how will he stop it from happening again? Jim doesn’t have an answer for that. He goes to Harvey and tells him that someone must pay for this. There are more men than bullets. He asks Lucius to comb through any piece of evidence, but the size of the crime scene is too big. Still, he wants Lucius on it. Harvey tells Jim that the building blew once he and Barbara arrived, but Jim isn’t sure she would do this. Right now, nothing makes sense anymore. For now, Jim places Harvey in charge. Over at the Church of Jeremiah, Bruce fights off some followers until he’s finally rescued by Alfred, who arrived thanks to Bruce’s signal. Bruce informs Alfred that Selina shackled him and she’s gone after Jeremiah alone. This could get her hurt or worse, but Alfred tells Bruce that he can’t save Selina from herself. Especially considering how often this happens. Jim pops by the Sirens’ club, where Barbara figures that he suspects her, given that Penguin was there and she wanted revenge for Tabitha. Barbara concedes that she could’ve killed him, but the person who blew up Haven has to be stopped. As the Sirens’ club could be next, Barbara has been putting out favors. 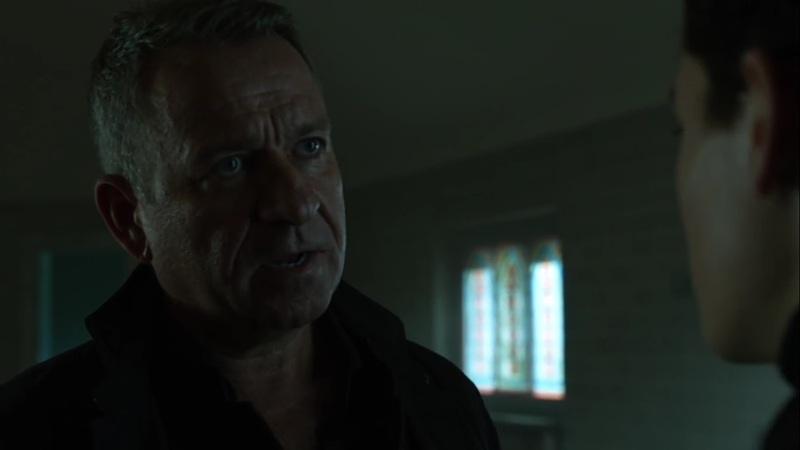 There’s been a shady guy lurking around Haven, but this is Gotham. She’ll have to be more specific. The guy is holed up at a building in a certain corridor. Barbara wants Jim to get on this, no favors. She does ask if Jim really thought she could’ve murdered those people. Truth be told, he doesn’t really know. That stings Barbara a bit, but she realizes that she deserves it. He gets a transmission from Harvey, who informs him that there’s a problem. Over at the precinct, Penguin has assembled some gang members to offer his assistance. It’s become apparently that Jim is outmanned, outgunned, and out of options. Thus, Penguin wants to provide his services. This service translates to many guns and bullets for the officers to use. No strings attached. Oswald lost people, too. He wants to put aside their grievances and get some justices. We return to the reawakening adventures of Edward Nygma as Riddler awakens and opens a nearby briefcase, which turns out to be empty. Apparently he’s been on a trip and he left himself a message on his left hand. It has to do with an inmate who apparently knows something. The entourage of the GCPD and Penguin’s crew hit the streets, with Jim having second thoughts about giving thoughts to now dead citizens. They arrive at the location provided by Barbara’s information. Penguin has a megaphone and announces the united forces, and this not only blows their cover, but the megaphone is immediately shot and destroyed. 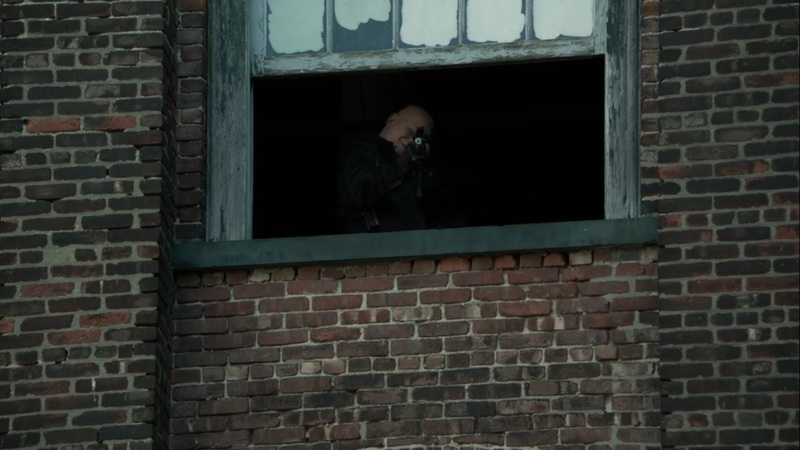 Everyone takes a cover position from the gunman who turns out to be none other than Victor Zsasz. 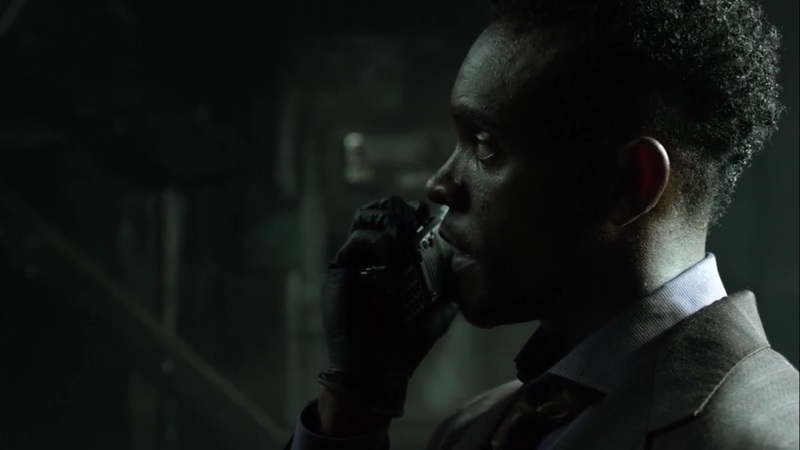 So Riddler slips into the GCPD to grab a file from the records annex, when he’s confronted by Lucius Fox. After being given a riddle: “I am given, and I am taken. I was there from your first breath and I will follow you until your death,” Lucius realizes that Ed wants the name of this particular Blackgate prisoner. It’s valuable to Ed, after all. Fox, though, wants Ed’s expertise. He informs Ed about the explosion and wants help in getting to the bottom of what happened. Explosives aren’t exactly Lucius’ expertise, after all. 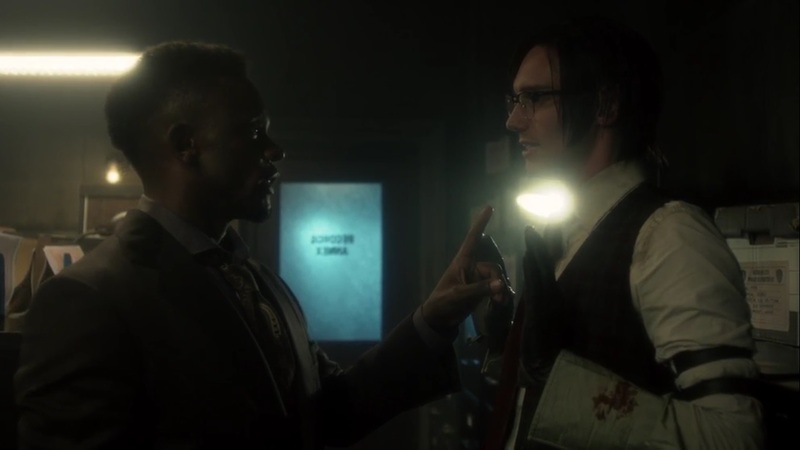 Riddler tries to just take the file from Lucius, but no dice. 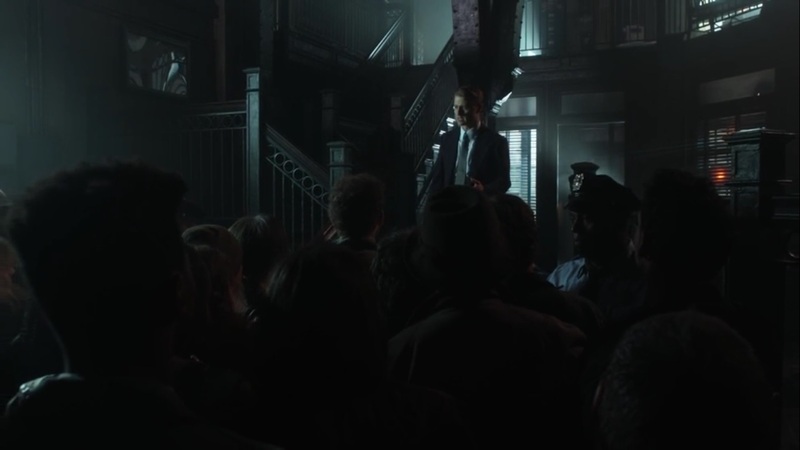 Zsasz tells the GCPD that he wouldn’t take credit for someone else’s work and that he didn’t blow up the building. 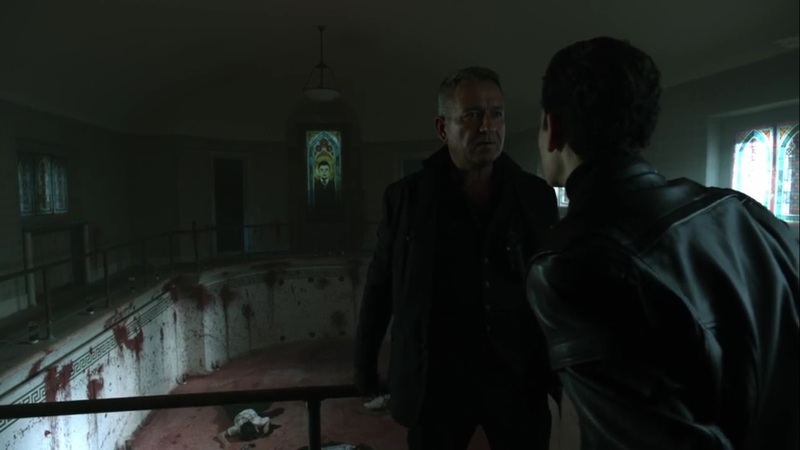 He wants Oswald to move past Sofia Falcone and the whole betrayal thing, but Jim tells Oswald to concentrate. Penguin’s men have enough firepower to keep Zsasz occupied for a few minutes, which is what Jim needs for enough of a diversion to slip off. 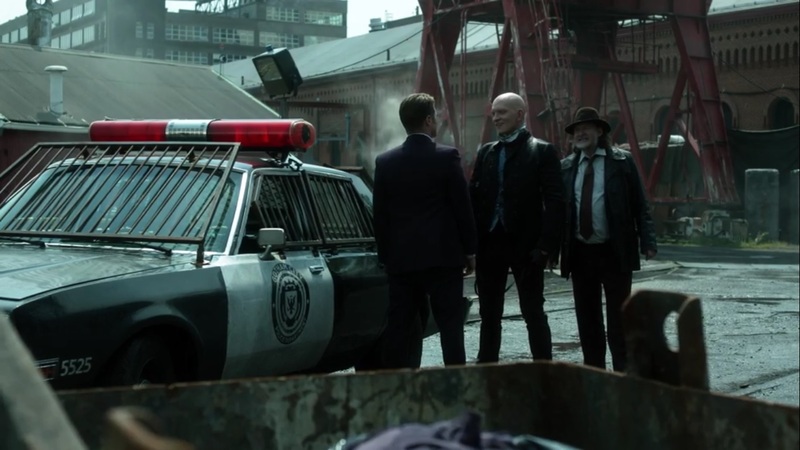 He manages to arrive at Zsasz’s location just as the officers and gang members cease fire. 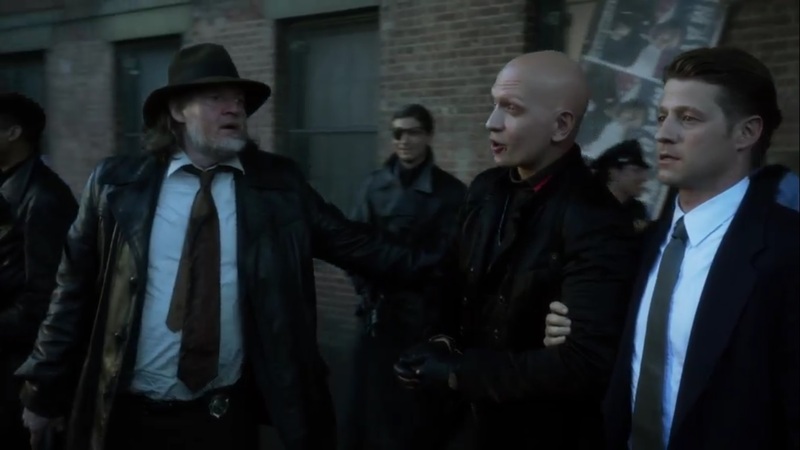 Before Zsasz can open fire, Jim gets the drop on Victor and hauls him off in cuffs. 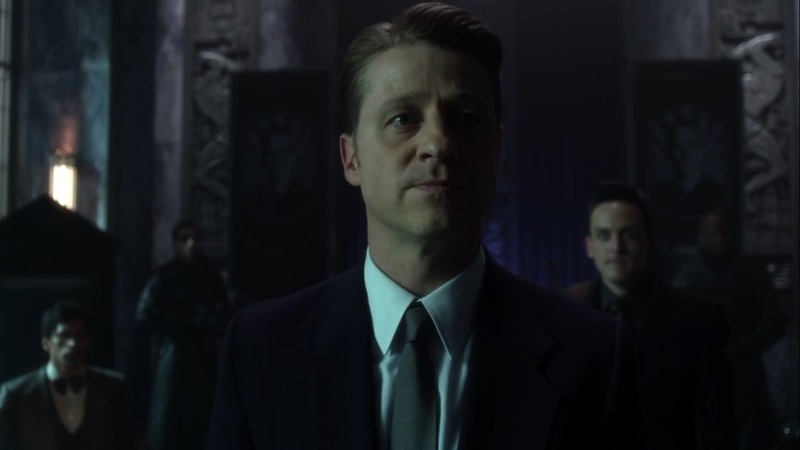 Penguin wants Zsasz for himself, but Jim wants to know if Victor was responsible for what happened at Haven. Also, if so, was this part of something larger? So right now, Lucius belongs to Jim. We return to the Dark Zone, where Selina follows Ecco and the new pilgrims from a distance. She happens upon a worker who is complaining about the digging crew not being able to cover enough ground in the next few days. He ends up dying for his complaints. And who killed him? None other than Jeremiah for himself. He tells everyone to dig a little deeper, because that’s the only way you make a house out of this hole. 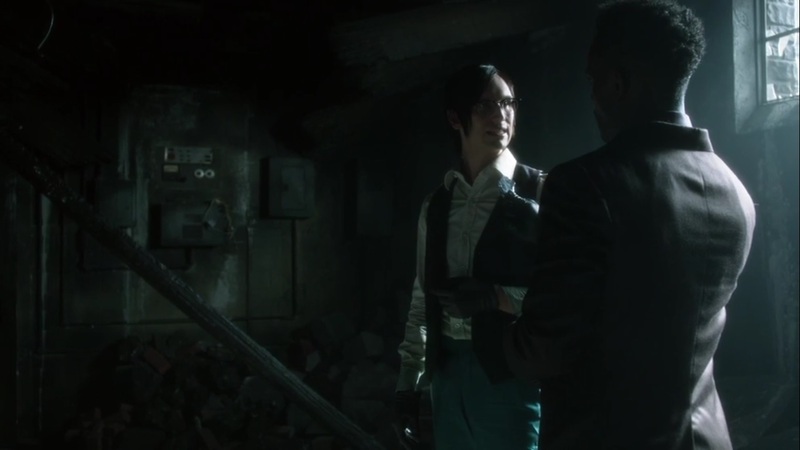 Riddler and Lucius explore the remains of Haven, with Riddler ruling out C4 based on the building’s structure. Based on what kind of bomb this would need, it could be an inside job. So the killer was in the building, but the bomb was the building. Highly pressurized power would detonate the building, but then there’s the glass. The explosion would make the glass go outside, but whatever heated the tanks would smash through the window. 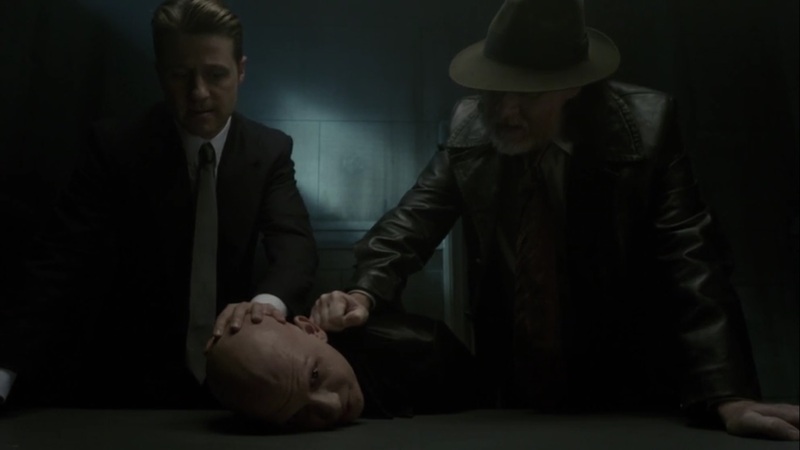 Meanwhile, Jim and Harvey interrogate Zsasz, who says that he helped himself to some supplies at Haven. He only opened fire at the cops because they fired at him. Plus, those were only warning shots. If he wanted to blow an entire building, he’d have his entire body covered in scars. Alvarez arrives with a message from Lucius, who tells him that Haven was blown by an RPG, not a bomb. He’s holding what’s left of it in his hand. 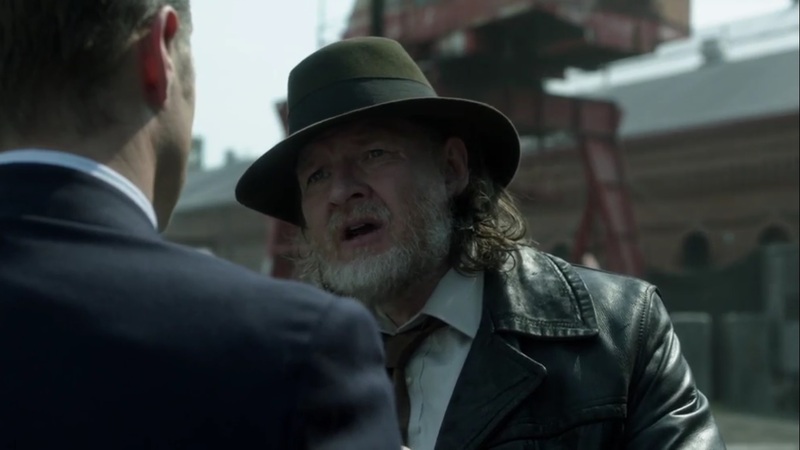 He’s just trying to figure out what rooftop it was fired from, and Zsasz was seen leaving the building before it blew, so Jim will need a new suspect. 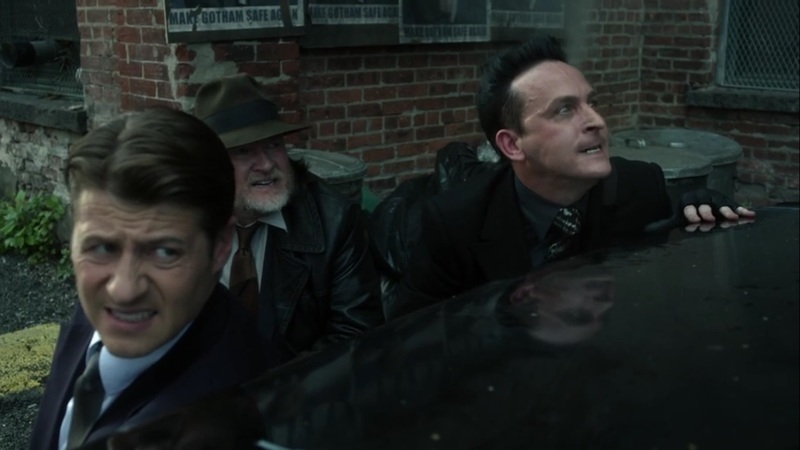 Then Penguin arrives just as Jim tells both him and Harvey that Zsasz couldn’t have blown up the building. But Penguin didn’t come alone. 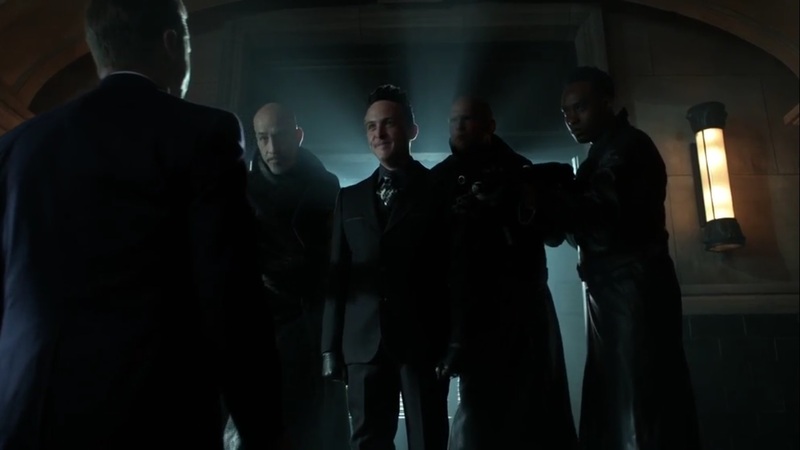 He’s brought the gangs with him and wants Zsasz brought to him. A tortured confession wouldn’t help, and Oswald knows that’s true. They can’t rush to judgment. Instead, there will be a trial. The people will decide Victor Zsasz’s fate. With that, Zsasz is hauled off. 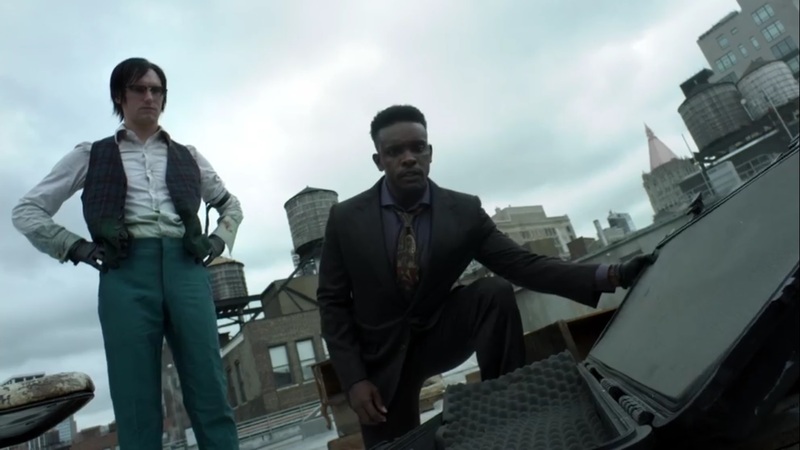 Lucius and Riddler head to a rooftop that faces opposite Haven- this is where the RPG was fired. The trajectory would lead an RPG right into the fuel tanks. Oh, and the RPG case is also on the rooftop. So they know how this was done. This may hold some clues as to who, though. Riddler figures that someone who did this wouldn’t forget to wear gloves, but it’s all that Lucius has. Riddler hopes that Lucius finds who did this. With that, Lucius returns the file to Riddler as promised. He thanks Ed for his help. He won’t deny saying that if Ed tells others. The file belongs to an apparently deceased inmate, which isn’t what Ed wanted. But then Riddler spots a woman across the way in another building and yells to find out if she knows what happened. But obviously she can’t hear him. Zsasz is brought to trial, with Jim figuring that this is what the people need. Penguin presents a witness who claims that Zsasz exited the building just before the explosion. And most of the audience agrees with this. 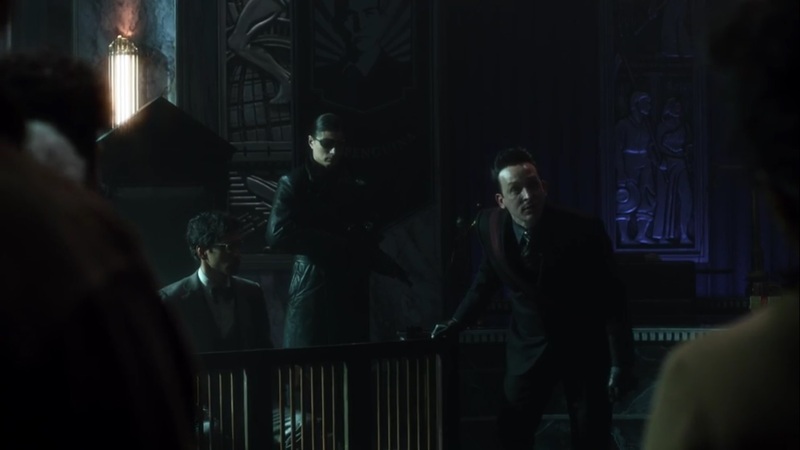 Penguin rallies against Jim, saying that Gordon apparently believes Zsasz isn’t responsible for the bombing. Oswald invites Jim an opportunity to say something. Jim says that it wasn’t a bomb that destroyed Haven, but a rocket propelled grenade fired from a rooftop. Zsasz couldn’t have done it. Jim knows that the people want justice. They’re scared. 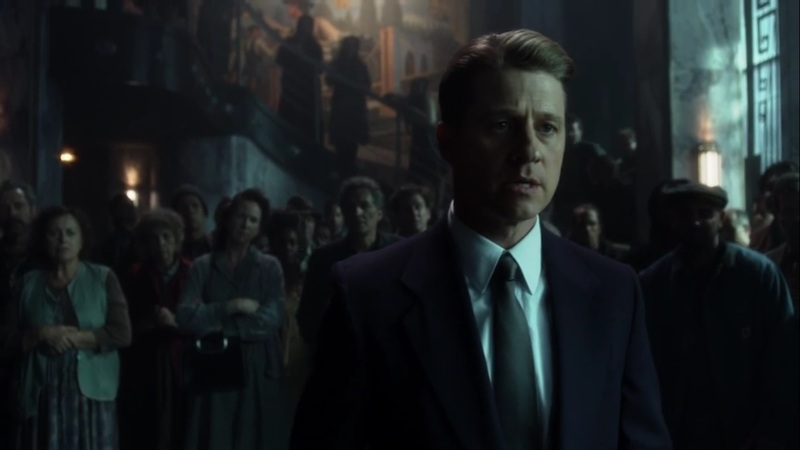 They’ve heard Jim say for months that help is coming, but the people of Gotham may be on their own. If that’s true, then what they do now is more important than ever. This sort of trial isn’t justice and doesn’t represent who they are. Oswald considers that Jim’s closing argument. The defense rests, so Penguin puts it to the crowd. 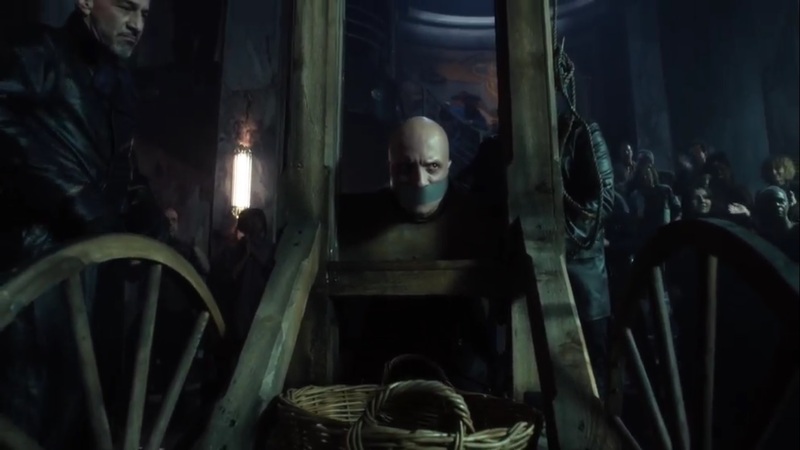 The public jury ultimately decides that Zsasz must pay. So he’s brought to a guillotine of all things for his execution. By the power vested in Penguin by…himself, he sentences Victor Zsasz to death. He asks Zsasz for any last words. Since Zsasz is gagged, he can’t actually speak. Well said. 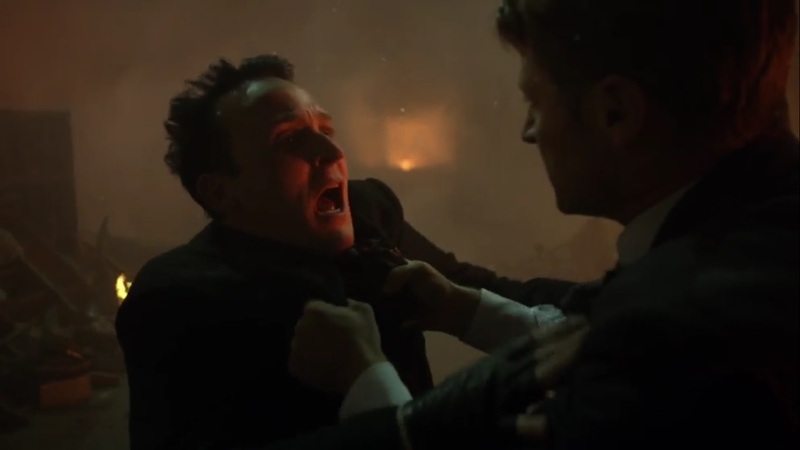 Either way, Jim and Harvey intervene and rescue Zsasz from the blade. Penguin tells the people that Jim cares more about a murderer than the people. Thus, the citizens don’t believe in him anymore. They’re all his. 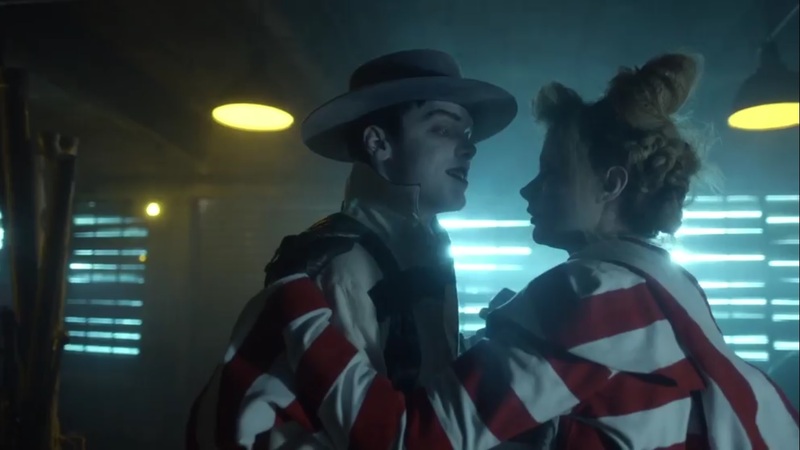 Maybe so, but Jim slugs Oswald and leaves with Zsasz anyway. 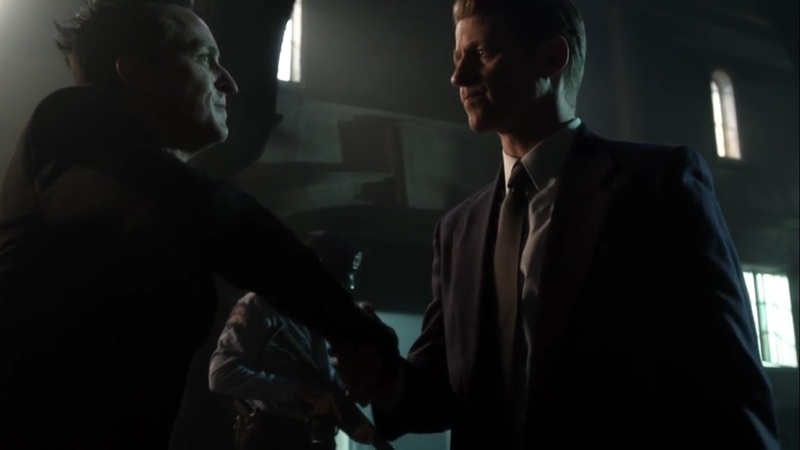 Harvey doubts that Zsasz will be safe at the GCPD, but luckily, they’re not taking him there. This is indeed a catch-and-release, as Jim has no other options. 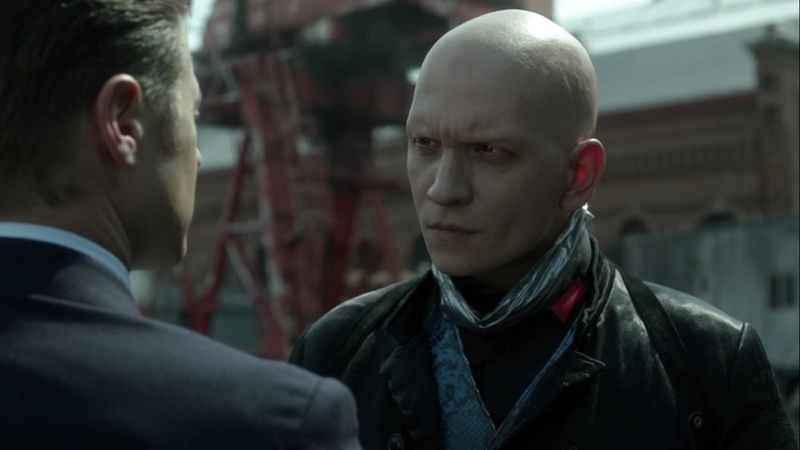 Zsasz tells Jim that the city will always belong to the bad guys. 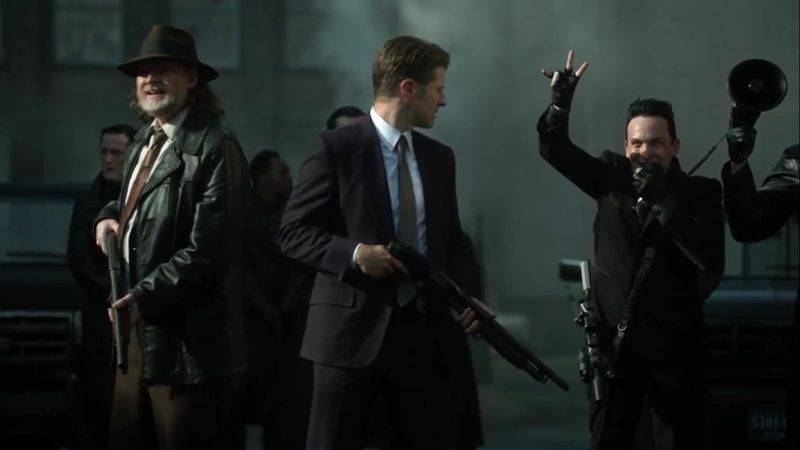 Jim tells Harvey to give Zsasz his gun, and as Victor goes for it, he ultimately refuses. Jim knows that people like Victor will always try to own the city, but they won’t. With that, Zsasz heads on his merry way. Harvey tells Jim to never ask him to do anything like that again. Jim of all people shouldn’t be proposing a shootout. He then tells Jim to pull himself together. Some of Jeremiah’s followers find themselves taken out one-by-one as Alfred and Bruce explore the tunnels. Not too far, Jeremiah watches his other followers continuing to dig deeper and deeper. 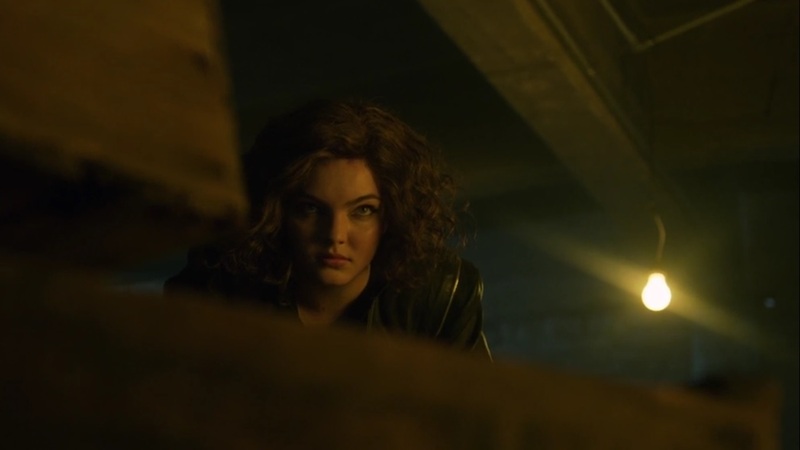 Then Selina arrives and stabs Jeremiah multiple times. Bruce and Alfred arrive as Alfred tosses a smoke grenade, giving the three ample time to escape. Riddler arrives at the home of the woman from the opposite building- unit #1215- and asks what she saw. She remembers seeing him on the roof with a rocket and him shooting it at the building. As Riddler considers this, the woman hits him over the head. 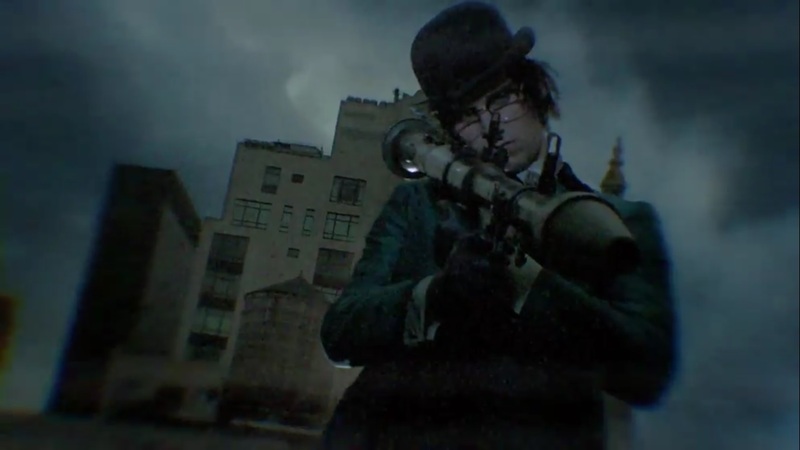 We then see glimpses of Riddler indeed aiming an RPG at Haven and blowing it to smithereens. So that’s what the message “#1215 knows” meant. Riddler knows that the woman won’t tell anyone this because he rolls her out the window, where she plummets to her death. Oh, come on, Ed. That’s just not fair. Later that evening, as Jim has a drink, Barbara joins him. Her tip didn’t pan out, but she’s got another one- a lead on a guy selling RPGs. She knows that some of Jim’s people went to Penguin. Like Jim, she just wants to protect her people. Right now, she sees Jim as someone who is all alone again. No one knows what it’s like to be him. Jim wants Barbara gone, but Barbara just goes in for the kiss anyway. Before Barbara can leave, Jim brings her in for a longer, deeper kiss as the episode comes to a close. Oh, Jim. You were doing so well. 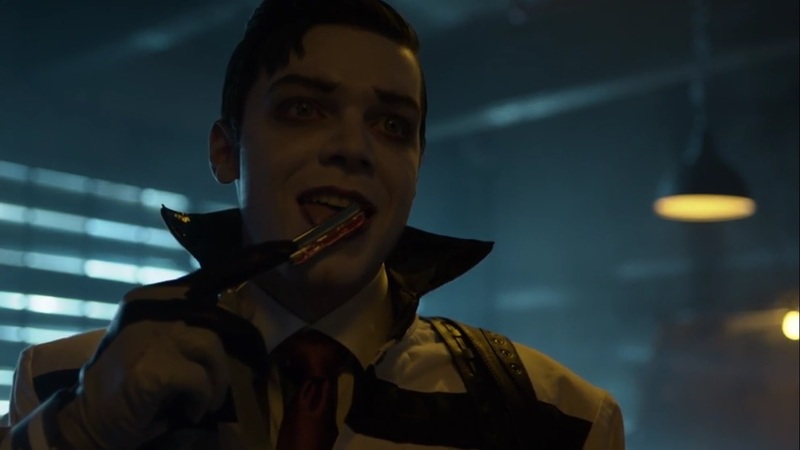 So as far as the main plot on Gotham goes, we’re dealing with the fallout from “Penguin, Our Hero.” Not just in Haven being blown to hell, but also the war over Gotham’s soul. And right now, Jim is slowly but surely on the losing side of that battle. Haven was a sign of hope for citizens suffering throughout the city. Now that it’s gone, the people want someone to blame. Given how much Jim has tried to build their spirits and encourage them to keep hope alive, he’s the prime target. Tempting as it might be, Jim won’t allow himself to fall into despair. Otherwise, who can the people believe in if he starts to falter? The blowing up of Haven, though, is the last straw for many. They want justice and it can’t come fast enough. So of course Jim’s speech in Zsasz’s defense wouldn’t be enough to sway hearts and minds. Gotham’s citizens want blood. Zsasz appears guilty enough, so that makes him a likely scapegoat for the people to exact their revenge. It helps that they have Penguin leading the charge. Good on him for volunteering his resources to Jim, as they want the same thing. 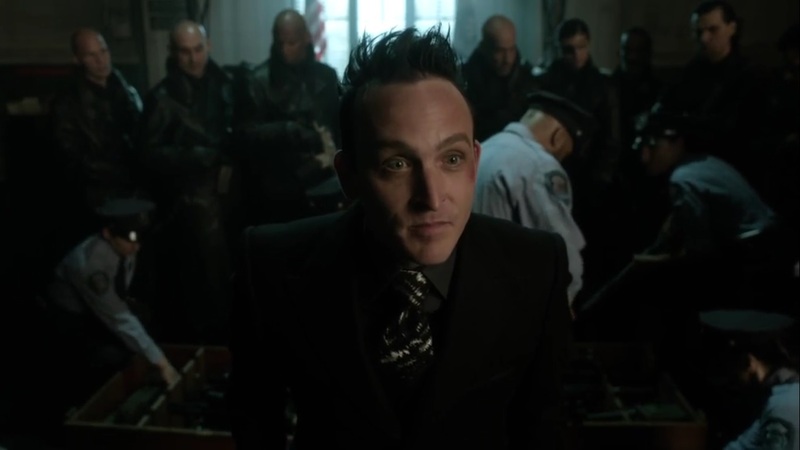 However, if the last episode was any indication, Penguin still has what it takes to win the people on his side. 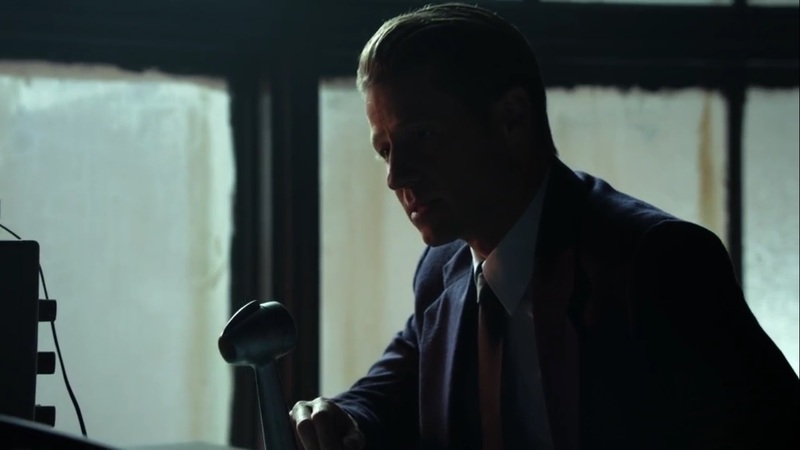 If the GCPD won’t get revenge for Haven being destroyed, then Penguin will. It’s easy for the people to jump on board with his kangaroo court if it means justice is served. But this is where the line is crossed between justice and vengeance. The evidence points to Zsasz’s innocence, but that doesn’t matter because the people of Gotham have already declared him guilty. When diplomacy doesn’t work, Jim decides to screw the rules and just take Zsasz for himself. 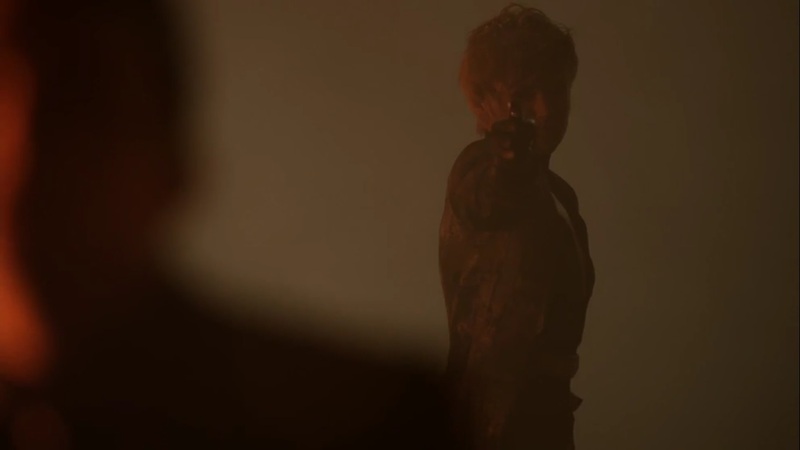 However, as we saw with his shootout proposal, even he can be pushed to the brink of madness. It’s very telling for a former loose cannon cop like Harvey to tell Jim to pull himself together. 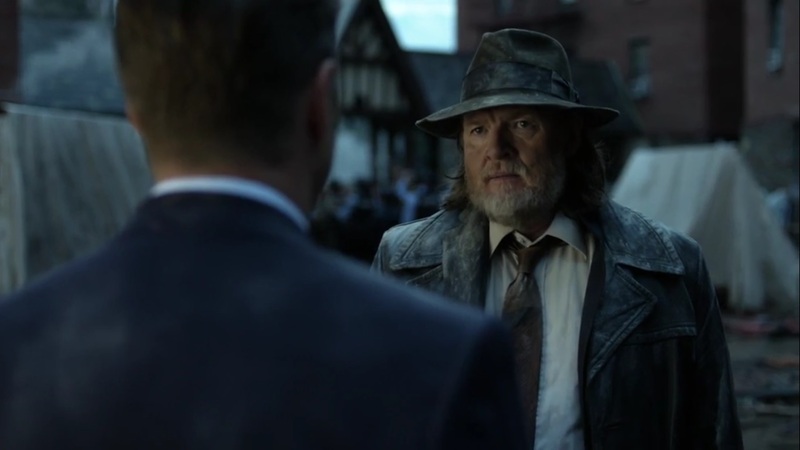 There’s no telling how Jim would’ve fared in a shootout with Zsasz, but the fact that he even suggested it was troubling for Harvey. Again, it’s nice to see Harvey being the moral compass for when Jim is on the verge of losing his way. After all, he doesn’t completely doubt that Barbara blew up Haven. While there’s no evidence pointing to her guilt, and even though he’s known her for so long, Jim doesn’t put it past Barbara to murder so many people. Even he can be so desperate for a resolution that he considers pointing the finger at her. But then they kiss. I’m guessing this is because, at this point, Jim just wants some form of satisfaction. Given everything Barbara has done, you would think that Jim would be happy with her leaving. But like she pointed out, he’s all alone right now. Nowhere else to turn than the crazy lady who has tried to have you killed on several occasions, I guess. 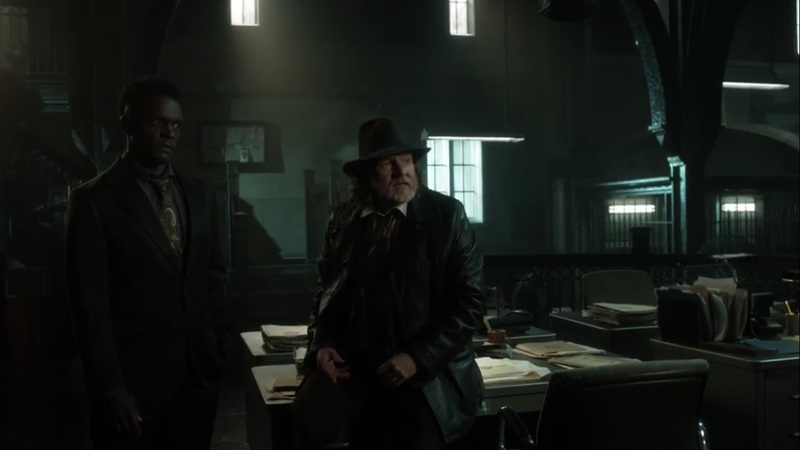 Sticking with the GCPD side of things, I really enjoy seeing Lucius and Ed team up again. Not only do they make a great team with their smarts, but both got something out of it in the end. 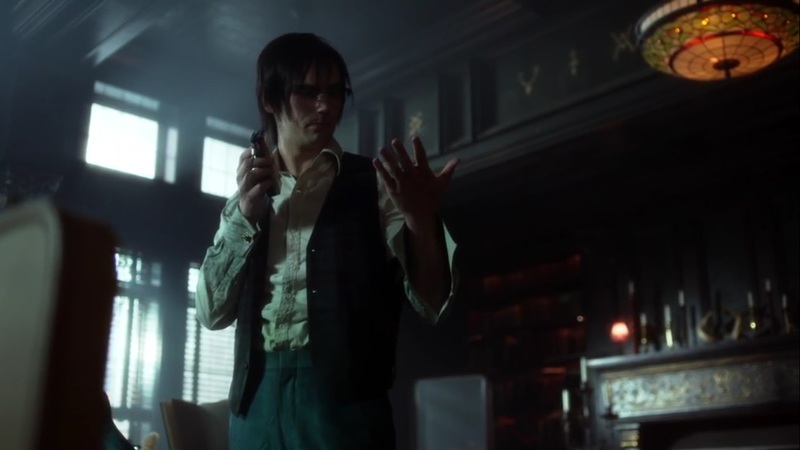 Lucius found out what really blew up Haven, while Riddler not only got the inmate information, but learned the devastating truth that he was responsible for Haven. How that came about, however, remains to be seen, but at least now Riddler is starting to get an idea of what’s happening while he sleeps. 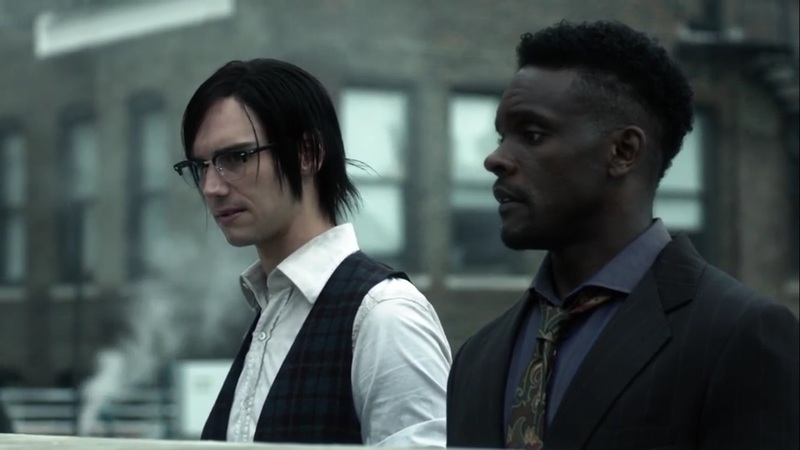 Also, it’s nice that Lucius acknowledges Nygma’s intelligence. The two could’ve been at odds the entire time, but like everyone else, Riddler wanted to get to the bottom of the attack. Then we have the brief moments in the Dark Zone with Jeremiah making his grand return. Not a lot of him, and that’s fine because his presence is felt throughout and Cameron Monaghan continues to shine in the role. Plus, Jeremiah and Ecco dancing? Nice moment there. This really is a demented relationship, but what would you expect from these two? 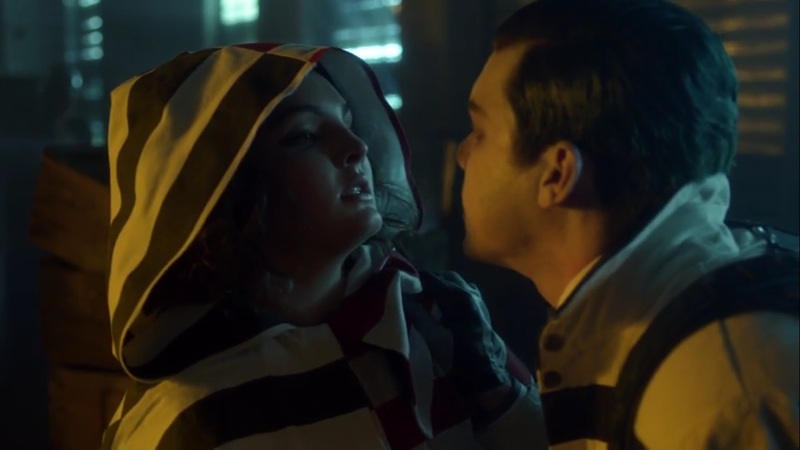 Also, what does Selina really expect from stabbing Jeremiah? She’s got to know that this isn’t over. She’s street strong and a fighter, but she can’t be naive enough to think that she’s exacted her revenge on Jeremiah. If anything, when the truth is revealed, this could lead her down an even darker path. Thus, Bruce would have to consider what Alfred said: he can’t save Selina from herself. They’re friends, yes, but she’s going to chart her own path. As she told Bruce, she’s not his to save. So even though they may want the same thing, Bruce will have to decide when, if at all, he lets Selina go. In the meantime, what will Gotham’s citizens do upon learning that Jeremiah is apparently dead? And what does Riddler do with the knowledge that he blew up Haven? We’ll find out next time, same Bat-time, same Bat-channel. See you then. This entry was posted in Gotham and tagged Anthony Carrigan, Barbara Kean, Ben McKenzie, Bruce Wayne, Bruno Heller, Cameron Monaghan, Chad Fiveash, Chris Chalk, Cory Michael Smith, David Mazouz, Detective Alvarez, Donal Logue, Ecco, Edward Nygma, Erin Richards, Francesca Root-Dodson, Harvey Bullock, J.W. Cortes, James Stoteraux, Jeremiah Valeska, Jim Gordon, Lucius Fox, Nathan Hope, Oswald Cobblepot, Robin Lord Taylor, Sean Pertwee, The Riddler, Tze Chun, Victor Zsasz by omarid513. Bookmark the permalink.